H7N9: The Next Influenza Pandemic? Since May of this year, 440 Chinese people have been infected with a new strain of influenza subtype H7N9, and 122 of them have died. Though the case-fatality rate suggested by this data is greatly inflated by asymptomatic and mild (and hence, unreported) cases, a new analysis in Trends in Microbiology suggests that the virus has the potential to become the next influenza pandemic. Due to its genomic structure and the fact that a single animal can be infected by more than one strain at a time, influenza is prone to reassorting its genome. In other words, RNA segment #1 from influenza virus X can be replaced by the same RNA segment from influenza virus Y. 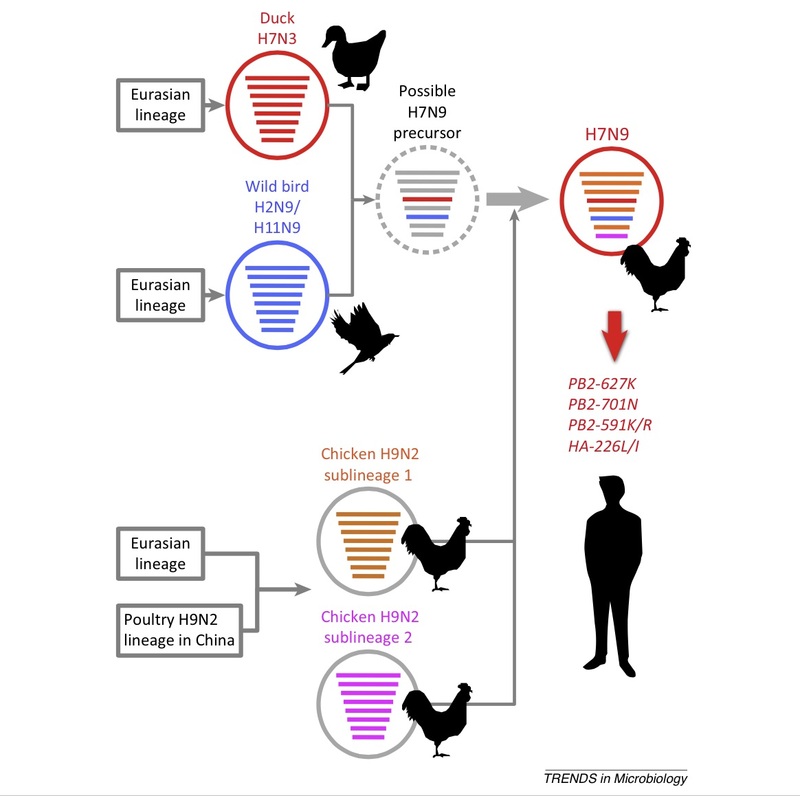 In the case of H7N9, it is believed that the “H7” gene came from avian influenza subtype H7N3, recently found in Chinese ducks, and that the “N9” gene came from either avian influenza subtype H2N9 or H11N9, both of which have been found in migratory birds. The six remaining RNA segments appear to have come from two different strains of H9N2. Such genetic shuffling is quite common and is often responsible for influenza pandemics. The reason is that new genetic combinations fool our immune systems; antibodies we might have against say, H1N1, are completely useless against H7N9 and other subtypes. Currently, the H7N9 strain is infecting mostly elderly men with underlying health issues who likely came into direct contact with live poultry. But, this could change. Once the virus is in humans, natural selection may favor the production of viruses that transmit more easily between humans. Such a transition probably would require very slight mutations in the “H7” gene (more properly called HA), as well as the gene PB2, which encodes an enzyme that helps replicate the viral genome. As always, there is no reason to panic, but you can be certain that epidemiologists are keeping a close eye on H7N9. Source: Tokiko Watanabe, Shinji Watanabe, Eileen A. Maher, Gabriele Neumann, Yoshihiro Kawaoka. “Pandemic potential of avian influenza A (H7N9) viruses.” Trends Microbiol pii: S0966-842X(14)00179-6. Published online: 2014-Sep-25. doi: 10.1016/j.tim.2014.08.008.